I have no idea where this recipe came from, but it has become a family favorite. 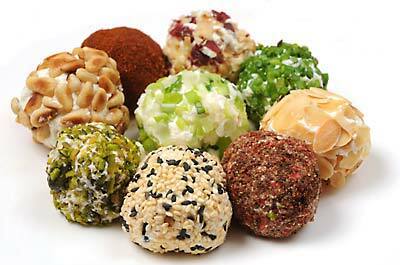 This picture shows that these or ANY cheese ball can be made what you want by just changing what you decorate the outside in and/or making them bite size by just adjusting how much you roll into each ball. We prefer them "bite" sized. In a very large bowl combine the cheddar cheese and cream cheese. Cover and let sit at room temperature for 1 hour. Add the preserves, milk, Worcestershire sauce, hot sauce and half the bacon. Roll mixture into desired number of balls. Roll each ball in desir4ed topping.